The thickly wooded island of Andros - Άνδρος, the most northerly and, after Naxos, the largest of the Cyclades, is a kind of south-easterly continuation of Evvia, from which it is separated by a busy and sometimes stormy channel only 8 nm wide. In the island's four ranges of hills, the largest of which is Mount Petalon (997 m), are marble quarries which were already being worked in antiquity. Thanks to its unusual abundance of water Andros - most Cycladic islands are rather barren - has a flourishing agriculture. To the south east, beyond an every narrower channel, is the island of Tinos - Τήνος. Its highest peak is Mount Tsiknias (713 m), at the east end of the island. The inhabitants live by farming on terraced fields. Characteristic features of the landscape are the Venetian-style tower-like dovecots, of which there are some 1300. There are also numerous windmills. It is prohibited to anchor near or set foot on the island of Yiaros, which is an arid and desolate island with no good anchorages. After the Second World War, particularly under the military dictatorship, it was a prison island and place of internment. Despite their charming ports both Andros and especially Tinos are rarely visited by charter yachts. Yet, the ports of Batsi, Gavrion and Kastro on Andros, and the ports of Panormos and Tinos on Tinos island are definitely worth extra mileage. In antiquity Andros was sacred to Dionysos, and its festivals in his honour were widely famed. 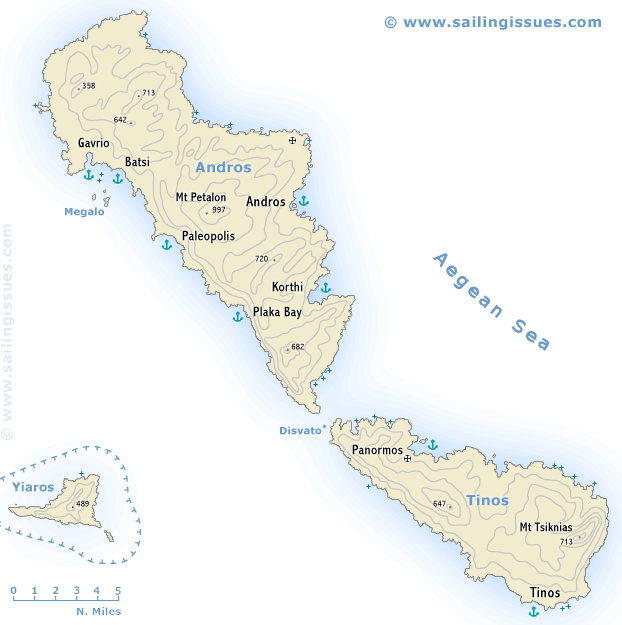 Originally settled by Ionians, Andros came under the control of Eretria at an early stage. In the 7th c. BCE it sent settlers to Chalkidiki. After the Battle of Salamis, when it had supported the Persians, it was unsuccessfully besieged by Themistokles. Later it became an ally of Athens; then in 338 BCE it fell into the hands of the Macedonians, and thereafter became Roman. From 1207 Andros was ruled by Venetian dynasts, who built the watch-towers still to be seen on the island. At the beginning of the 15th c. Albanian incomers settled in the north of the island, preserving their language into the 20th c. In 1566 Andros was occupied by the Turks, and remained in Turkish hands until the establishment of the Greek State in the 19th c.
In ancient times, from the 3rd c. BCE onwards, the Sanctuary of Poseidon and Amphitrite was a major religious centre and in our own days, since the early 18th c., Tinos has possessed a leading shrine of the Orthodox Church. Held from 1207 to 1712 by Venice, Tinos had the longest Frankish period of any part of Greece, and in consequence its population includes a considerable proportion of Roman Catholics. The Orthodox population began to increase from 1822, when - during the War of Liberation - a nun named Palagia, guided by a vision, found a wonder-working icon of the Panayia, which soon became the object of annual pilgrimages of the feasts of the Annunciation (25 March) and Dormition (15 August), so that Tinos developed into a kind of Greek Lourdes. The island came into international prominence when on 15 August 1940, two months before Mussolini's declaration of war, an Italian submarine torpedoed the Greek cruiser "Elli", which was lying in Tinos harbour for the Feast of the Dormition. Syros and Paros are the closest yacht charter bases to Tinos and Andros, although Mykonos is even closer it is only a minor (but rapidly growing) charter base. Most sailing holidays will start in Athens or Lavrion, though, which are much larger bases to charter a yacht from.